SAINT JOHN, N.B. -- As flood waters continue to rise in southern New Brunswick, so too do concerns for health and safety. 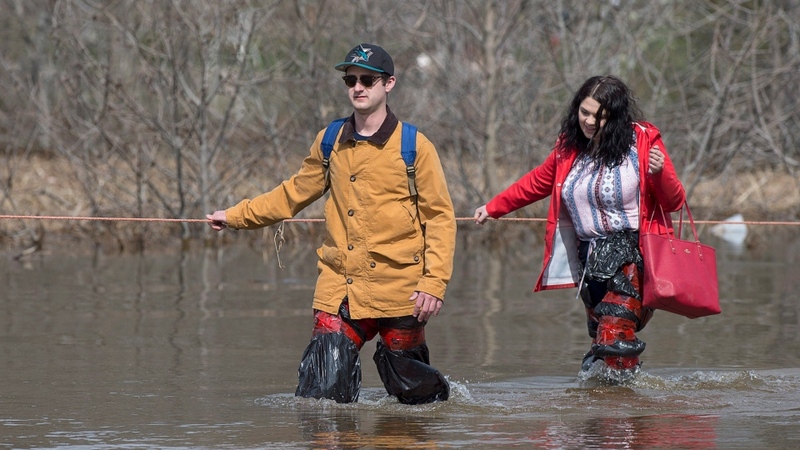 "Lots of sewage systems have been compromised by flooding, and when they're overwhelmed the sewage has no place to go but into the water courses or to backup into houses," said Greg MacCallum, director of New Brunswick's Emergency Measures Organization. "The flood water can be heavily contaminated with sewage as a result and people need to be mindful of the health risks, the risks of infections that come with that, as well as the risk of sickness and gastrointestinal illness," he said. Kevin Clifford, the director of Emergency Management for Saint John, also cautioned people about being in contact with the flood waters. "Certainly people understand the water looks different. It looks brown and it's certainly contaminated with a whole host of things," he said. The provincial EMO issued warnings for people who have private well water supplies affected by flooding, saying they should not be used until they have been disinfected and tested. "If you think that your well may be affected by chemicals such as furnace oil, gasoline or agricultural chemicals, you should not use water from the well for any purpose whatsoever -- even if it has been boiled," the warning reads. "There is no capacity to receive more fluid so sewer backups are very likely if you use your plumbing (and maybe even if you don't)," their statement reads. "The Town sewer system works on gravity and flows to the lagoons for treatment. The lagoons have flooded and are overflowing into the river. As the water level rises, there is a potential for backup into the pipes. Your downstream neighbours will appreciate your restricted use until flood waters recede." 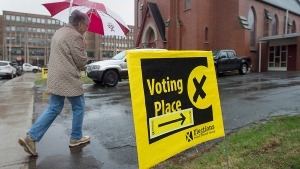 The four-lane Trans-Canada highway between Fredericton and Moncton remains closed due to flooding and rising waters have cut off routes to the community of Chipman. "I just want to be perfectly clear that while the access and egress from that community is a problem right now, we have in place systems and abilities to ensure emergency response into that community," MacCallum said Sunday afternoon. 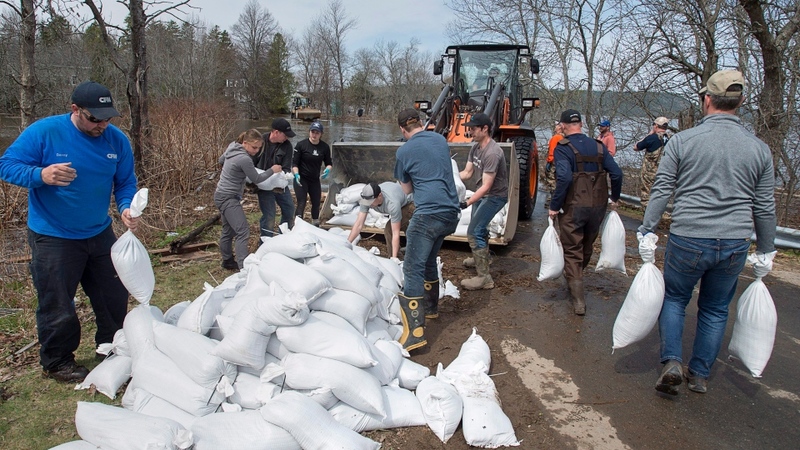 He said water levels in the southern half of the province were expected to continue to rise slowly over the next few days, and it would be late in the week before they'd begin to recede. Emergency officials have repeatedly urged residents in flooded areas to evacuate their homes, but many are staying put -- using sandbags and pumps to protect their properties. Stephen Brittian was helping to co-ordinate efforts to get sandbags to homes in an area of Rothesay on Sunday. Front end loaders were able to take a few hundred sandbags at a time through the flooded street, while just a day earlier homeowners were taking a few at a time in canoes and a flat-bottom boat. Brittian said while many homes had been saved from the rising waters, others were not so lucky. "There are some houses that did not get protected, some cars and so on. It took everybody enough by surprise that there was no planning done and they didn't get the resources there in time," he said. Brittian said he was proud to live in a community where so many people had volunteered to do whatever they could for people affected. MacCallum summed it up by saying: "We've seen the worst of mother nature, and the best in human nature." In Saint John, boats were being used to ferry people back and forth to homes and subdivisions that have been isolated by the flooding. Jeff Sheehan carried a large suitcase full of clothes and other supplies that his daughter needed for a dance recital Sunday. Kim Melanson held onto a rope as she walked through strong currents in knee-deep water to get out of her neighbourhood, but said she had a compelling reason to make the risky trek. "Because my grand-daughter is being baptized today and I didn't want to miss it," she said. Meanwhile Simon Barton and Chelsea Burley showed some ingenuity as they made the trek through the fast-moving water. While many people wore hip waders, the couple had made their own with supplies they had on hand. "Just some garbage bags and some tuck tape. It works great. My feet aren't wet," Barton said with a grin as he peeled the red tape off. The Coast Guard has deployed boats and staff to help with evacuations and patrols. The Red Cross, which has been helping to co-ordinate the evacuation of residents, has now launched an appeal for funds to help the people affected.